Quality flounder is easy to recognize. Fresh flounder never smells fishy, and the eyes should appear bright and clear, almost alive. The gills should be reddish, and the skin moist and with tightly adhering, shiny scales. Fresh flounder flesh should still be lightly coated with transparent slime; white slime is a sign the fish is too old. The flounder family is made up of many species of fish. 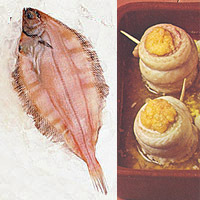 In the United States, East Coast varieties include gray sole (also called witch flounder), winter flounder (also called blackback), American plaice (also called dab or sand dab), yellowtail flounder (also called dab or rusty flounder), summer flounder (also called fluke), and southern flounder. West Coast varieties include petrale sole, sand sole, English sole, Rex sole, Pacific sand dab, Dover sole (not to be confused with the English fish of the same name), and California flounder. True Dover sole comes from England, and sand sole from France. Most flounders are small, and thus the fish is generally sold whole, fresh or frozen, trimmed of head and fin bones. The larger varieties may be available as fillets—also known as quarters—or halves, which are two fillets connected by a thin strip of gristle.